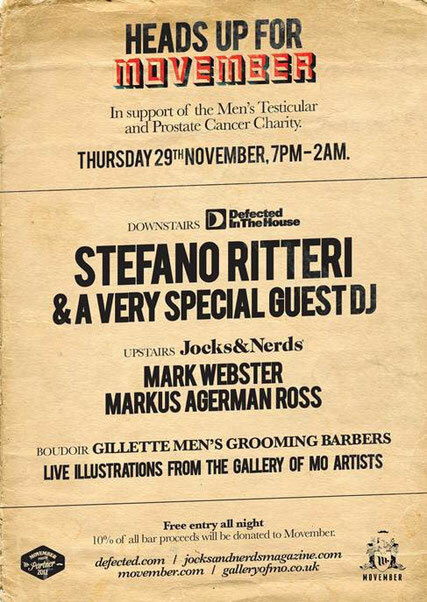 Next Thursday 29thNovember Defected Records are putting on a very special edition of Heads Up at the Horse & Groom, London in support of the charity Movember. The label has Stefano Ritteri playing along with a very special guest DJ, someone they can’t announce yet due to a London gig this weekend. But, Defected assure you that it’s someone you won’t want to miss! The label also has the Jocks & Nerds DJs hosting upstairs, as well as some Movember treats in the boudoir, with Gillette Men’s Grooming Barbers offering free shaves and trims along with live illustrations from the Gallery of Mo artists. 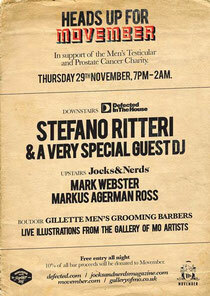 The Horse & Groom have also offered to donate 10% of the bar spend to Movember, so if you’re going, get drinking! Entry is free all night, but guestlist applies, so get blagging!